The upcoming release from Denmark’s most notable symphonic metallers works on a number of levels. Firstly, with ‘Hunter’s Moon’, Delain are capping off a trilogy which began with the ‘Lunar Prelude’ EP and was continued by their 2016 full-length, ‘Moon Bathers’. As well as bringing their thematic appreciation of celestial bodies to an apparent climax, the four new studio cuts featured here act as a tantalising precursor to a future LP due later this year. 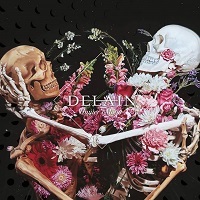 The rest of the album’s ten tracks are live recordings from Delain’s 2017 ‘Danse Macabre’ tour, which were also filmed for a Blu-ray release in order to fully depict the opulence of their stage show. The new material does a good job of encapsulating the band’s core sonic identity, while showing a surprising degree of variation across the four songs. ‘Masters of Destiny’ fixes its initial focus on Charlotte Wessel’s distinct voice before gradually increasing in grandiosity, allowing for moments of gothic theatricality courtesy of the string arrangements and the band’s signature use of eerie music-box style keys. The title track is more reflective of the sextet’s catchier numbers – instantly anthemic, yet still bone shakingly heavy thanks to the almost djent rhythms bedrocking the sustained esoteric melodic lines. The inclusion of Timo Somers’ growled vocals also prove to be a successful addition. Opting for a more prog rock approach, ‘The Silence Is Mine’ displays some impressive feats of technicality with its lead guitars and keys, while ‘Art Kills’ relies on heavy electronics to marry the band’s signature sound with an industrial stomp. Although it’s a rather jarring transition, the live recordings from Delain’s show at the Utrecht’s Tivoli venue represents them well as the bombastic live entity they have proven themselves as throughout the years. The string section on ‘Hands of Gold’ bears a glorious pomposity with George Oosthoek guest gutturals augmenting an already larger than life song. The new wave bent and melismatic vocal hook of ‘Danse Macabre’ is as effective as ever, while ‘Scarlet’ demonstrates the band’s balladeering prowess, with the cello parts giving further richness in texture. However, when Marco Hietala of Nightwish joins for the remainder of the album on backing vocals, there is a significant jump in quality. From the straight up power metal of ‘Your Body Is A Battleground’ to the sleaze rock swagger of ‘Scandal’, he provides a welcome energy and works remarkably well in tandem with Charlotte. The very nature of this release means it will likely only be a necessity for die-hard completists, due to the slightly disjointed combination of new material and the live performance. Regardless, both aspects of ‘Hunter’s Moon’ prove that Delain is still an enticing prospect in 2019, with the former whetting the appetite for the promised studio full-length, and the latter delivering on the band’s reputation as a live act, as well as showcasing the considerable strength of their back catalogue. ‘Hunter’s Moon’ is released on Friday 22 February. You can get your copy HERE. Delain play Download on Friday 14 June.